This chapter describes how to customize (edit) service-oriented architecture (SOA) components during runtime in a deployed composite with a runtime tool such as Oracle BPM Worklist, Oracle SOA Composer, or Oracle Enterprise Manager Fusion Applications Control or customize and extend (create) SOA components during design time in JDeveloper. It also provides recommendations for merging runtime customizations from a previously deployed revision into a new revision and instructions for synchronizing customized flexfields in the SOA MDS repository. Section 12.1, "About Customizing and Extending SOA Components"
Section 12.2, "Customizing SOA Composites"
Section 12.3, "Merging Runtime Customizations from a Previously Deployed Revision into a New Revision"
Section 12.4, "Extending or Customizing Custom SOA Composites"
Section 12.5, "Deploying SOA Composite Customizations and Extensions"
Section 12.6, "Extending a New Oracle SOA Suite Service"
For information about troubleshooting SOA issues, see Chapter "Troubleshooting Oracle SOA Suite" of the Oracle Fusion Applications Administrator's Guide. This chapter does not describe customizing and extending Oracle BPM Suite. Oracle BPM Suite is installed on top of Oracle SOA Suite, and provides the ability to run Business Process Management Notation (BPMN) processes. To accomplish this task, there are extensions to JDeveloper for working with BPMN (Oracle BPM Studio) and a web-based application for working with BPMN processes (Oracle Business Process Composer). For information about BPMN process flows, see Chapter 7, "Customizing and Extending BPMN Processes ." For information about Oracle BPM project templates, see Chapter 13, "Customizing and Extending Oracle BPM Project Templates." Oracle SOA Suite extensions cannot be used with the Integrated WLS. If an application has references to Oracle SOA Suite shared libraries, then customizations on the application cannot be tested with the Integrated WLS. SOA provides an enterprise architecture that supports building connected enterprise applications to provide solutions to business problems. SOA enables you to develop enterprise applications as modular business web services that can be integrated and reused, resulting in a flexible, adaptable IT infrastructure. SOA separates business functions into distinct units, or services. Oracle SOA Suite provides a complete set of service infrastructure components for designing, deploying, and managing composites. A composite is an assembly of services, service components, and references designed and deployed in a single application. Wiring between the services, service components, and references enables message communication. Define complex task routing slips for approval management by taking into account business documents and associated rules to determine the approval hierarchy for a work item. Additionally, approval management lets you define multistage approvals with associated list builders based on supervisor or position hierarchies. You can also define expiration, escalation, and notification configurations. For example, an expense approval task may use rules to define its approvers. Approval configuration and assignment rules are within the context of a human workflow. Define a business decision based on rules that enables dynamic decisions to be made at runtime that automate policies, computations, and reasoning while separating rule logic from underlying application code. For example, you can define a business rule to select a supplier with the lowest shipping price to fulfill a shipping order. Nonapproval business rules are in the context of Oracle SOA Suite, but outside of human workflow. Use of standalone rules in non-Oracle SOA Suite applications is supported. You can completely control how the rule dictionaries are structured and how these applications are patched. You may structure the rules as recommended for Oracle SOA Suite rules, as described in this chapter. Operate on actual data values that move through the infrastructure at runtime. Domain value maps enable you to map from one vocabulary used in a given domain to another vocabulary used in a different domain. For example, one domain can represent a city with a long name (Boston), while another domain can represent a city with a short name (BO). In such cases, you can directly map the values by using domain value maps. Extend a workflow that describes the tasks for users or groups to perform as part of an end-to-end business process flow. For example, a vacation request workflow is assigned to a manager. The manager must act on the request task three days before the vacation starts. If the manager formally approves or rejects the request, the employee is notified with the decision. If the manager does not act on the task, the request is treated as rejected. Notification actions similar to the formal rejection are taken. Integrate a series of business activities and services into an end-to-end process flow. For example, a BPEL process flow calls a credit rating service. When you run this process, you enter a social security number into a user interface. The credit rating service takes the number and returns a credit rating. Define services that perform message and event routing, filtering, and transformations. For example, Oracle Mediator can accept data contained in a text file from an application or service, transform it into a format appropriate for updating a database that serves as a customer repository, and then route and deliver the data to that database. For more information about these components, see Oracle Fusion Middleware Developer's Guide for Oracle SOA Suite. The tool to use depends on the component you are customizing or extending and whether you are performing these tasks during runtime or design time. Table 12-1 provides details. If you are customizing approval configuration and assignment rules or nonapproval business rules for a deployed project (either for Oracle SOA Suite or Oracle BPM Suite), always use Oracle BPM Worklist or Oracle SOA Composer. If you are customizing approval configuration and assignment rules or nonapproval business rules as part of a new Oracle BPM Suite project being extended in Oracle Business Process Composer, then use Oracle Business Process Composer. For information about using Oracle Business Process Composer, see Chapter 13, "Customizing and Extending Oracle BPM Project Templates." Note: If you use Oracle SOA Composer to customize approval configuration and assignment rules during runtime, changes in subsequent revision patches are not applied successfully. You cannot customize human tasks, BPEL processes, and Oracle Mediators during runtime in a deployed composite. When using Oracle SOA Composer, you can save your customizations in a sandbox environment without applying them to a running instance and later return to the sandbox to make additional customizations. These customizations are only applied to the running instance when you click Commit. Before you customize SOA components, you should be familiar with the Oracle Fusion application architecture that enables customizations, as described in Chapter 1, "Customizing and Extending Oracle Fusion Applications." You should also understand the typical workflows for working with runtime customizations, as described in Chapter 2, "Understanding the Customization Development Lifecycle." Install JDeveloper and set up your development environment. For more information, see Chapter "Setting Up Your Development Environment" of the Oracle Fusion Applications Developer's Guide. For customizations (changes to existing Oracle Fusion application artifacts), extend a customization application workspace. For more information, see Chapter 10, "Using JDeveloper for Customizations." Launch JDeveloper in the appropriate role. As described in Table 12-1, you can customize SOA components during runtime in a deployed composite with a runtime tool. This section provides an overview of these tasks and provides references to additional documentation for more specific instructions. You cannot customize SOA components in CRM Application Composer. However, you can extend a business event in CRM Application Composer and use the Event notification action to notify a SOA composite by email of the occurrence of the event. For information about extending events in CRM Application Composer, see Section 4.2, "Editing Objects." After accessing the runtime customization tool to use, select the data to customize. From the Open list in Oracle SOA Composer, select the data to customize, as shown in Figure 12-1. Table 12-3 describes the options available for selection. In the Administration section, click the Task Configuration tab. 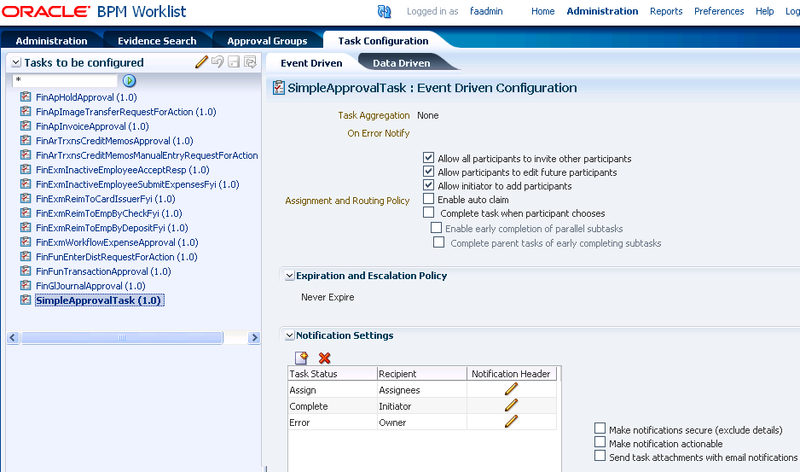 Select a specific approval configuration and assignment rule task to customize. The Event Driven and Data Driven tabs are now accessible. Select a task to view or customize from the list of task types. In the navigation pane in Oracle Enterprise Manager Fusion Applications Control, expand the SOA folder. Expand the partition in which the SOA composites are deployed (for example, default). 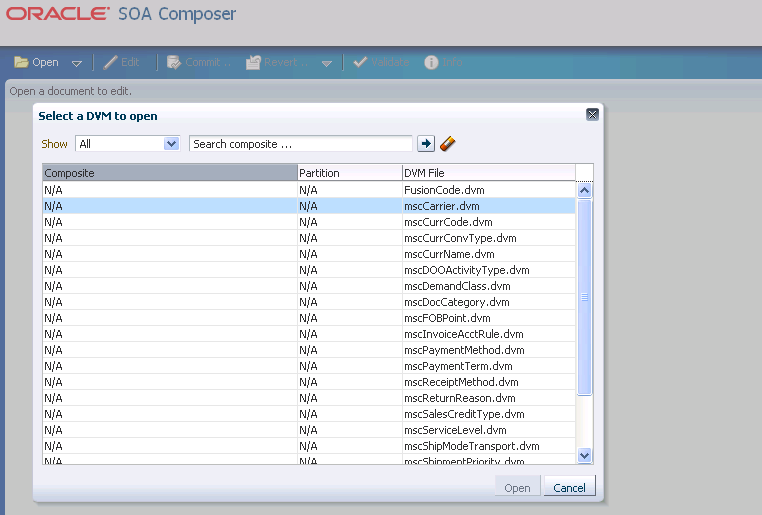 Select the SOA composite to customize. You can customize approval configuration and assignment rules included in a deployed composite in Oracle BPM Worklist (recommended), as shown in Figure 12-2, or in Oracle SOA Composer, as shown in Figure 12-3. Some strings are part of Oracle SOA Suite, other strings are part of the Oracle Fusion Applications-owned ADF resource bundle, and other strings are part of the Oracle Fusion Applications-owned SOA resource bundle. Task title, task outcome, approval reason, stage name, and participant type strings are stored in the Oracle Fusion Applications-owned SOA resource bundles. You cannot customize these because there is no support for that functionality in Oracle SOA Suite. Business object-specific text and sections are implemented in ADF and resource bundles are owned by Oracle Fusion Applications. These strings can only be customized in JDeveloper. The Oracle SOA Suite-owned strings correspond to those in the Comments, Attachment, and History sections in Oracle BPM Worklist. The actions along the top of the page (excluding the custom actions defined in the .task file) are also part of Oracle SOA Suite. These strings in the Oracle SOA Suite-owned resource bundles can be customized by following the instructions in Oracle Fusion Middleware Developer's Guide for Oracle SOA Suite. The subject (derived from the task title) and custom outcomes are defined in the Oracle Fusion Applications-owned SOA resource bundle. You cannot customize these because there is no support for that functionality in Oracle SOA Suite. You can customize the notification message (the first line of instructions in the email) during runtime in Oracle BPM Worklist. The remaining email content is the same as customizing the text in notifications in Oracle BPM Worklist. For more information about customizing business rules in Oracle SOA Composer, see Chapter "Using Oracle SOA Composer with Oracle Business Rules" of the Oracle Fusion Middleware User's Guide for Oracle Business Rules. You can customize domain value map rows included in a deployed composite in Oracle SOA Composer, as shown in Figure 12-5. For more information, see Chapter "Using Oracle SOA Composer with Domain Value Maps" of the Oracle Fusion Middleware Developer's Guide for Oracle SOA Suite. You can customize endpoint address properties for an external reference such as OWSM security policies and binding components included in a deployed composite in Oracle Enterprise Manager Fusion Applications Control. Figure 12-6 provides details about customizing OWSM security policies. For more information, see Section "Managing SOA Composite Application Policies" of the Oracle Fusion Middleware Administrator's Guide for Oracle SOA Suite and Oracle Business Process Management Suite. Figure 12-7 provides details about customizing binding component properties for services and references. For more information, see Chapter "Configuring Service and Reference Binding Component Properties" of the Oracle Fusion Middleware Administrator's Guide for Oracle SOA Suite and Oracle Business Process Management Suite. SOA composites in Oracle Fusion Applications reference copies of the original XSD schema files included in the SOA Metadata Services (MDS) repository. When you customize and deploy Oracle Fusion Applications flexfields (or upgrade the base table, after which the flexfields are automatically re-applied), which result in a new XSD being generated in the Oracle Fusion Applications MDS, the updated XSD files must be synchronized in SOA MDS for use in the fact models in business rules. To perform this synchronization, a special SOA composite named UpdateSOAMDS is included with Oracle Fusion Applications. By default, the UpdateSOAMDS composite is automatically deployed. When a synchronization is required, you manually invoke an instance of this composite to synchronize the updated XSD files in SOA MDS. 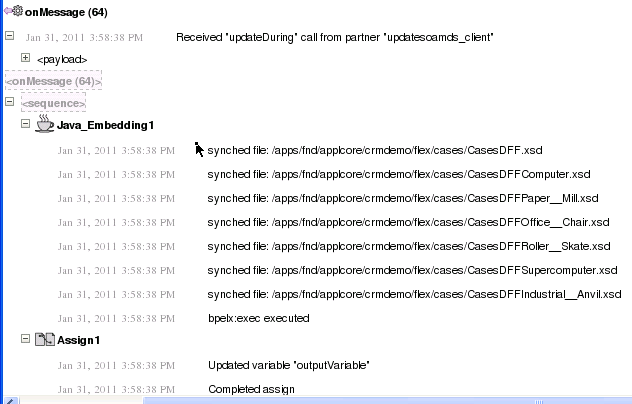 You can view the results of this synchronization in the audit trail in Oracle Enterprise Manager Fusion Applications Control. Log in to Oracle Enterprise Manager Fusion Applications Control. 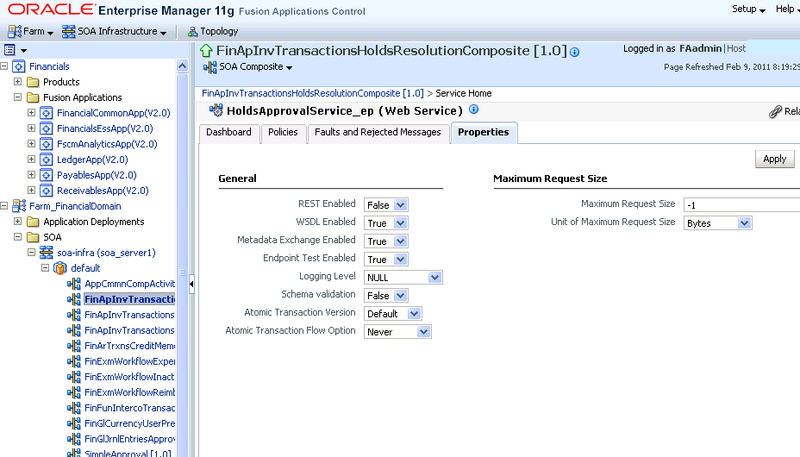 In the navigation pane, expand soa-infra and the domain. At the top of the Dashboard page for UpdateSOAMDS, click Test. In the Operation list, select the operation to perform, as shown in Figure 12-8. Table 12-4 describes the operations available for selection. Select to specify how far back in time to go to get flexfield updates for synchronizing in SOA MDS. Select to specify the time from which you want to get flexfield updates for synchronizing in SOA MDS. In the Value field of the Input Arguments section, enter a value, as shown in Figure 12-9. Table 12-5 provides details about the value to specify. Enter P50D to go back fifty days to get flexfield updates that occurred. Enter P1M2DT3H to go back one month, two days, and three hours to get flexfield updates that occurred. This operation uses the xsd:dateTime type as input to obtain the data. For example, entering 2011-02-10T00:00:00 gets flexfield updates that have occurred since February 10, 2011. The list of XSD schema files synchronized in SOA MDS is returned as output in the Response tab, as shown in Figure 12-10. All rule dictionaries in SOA MDS that use the impacted XSD schemas are altered. The data model of the rule dictionaries is modified and the fact types are re-imported. After re-importing the XSD schemas, the rule dictionary is saved in SOA MDS. The JAXB 2.0 classes for the fact type model of the rule dictionaries that have been altered are regenerated and compiled into the appropriate composite SCA-INF/gen-classes directories. Other SOA instances in the cluster are notified of the flexfield customizations. The composite class loader for the SOA composites where the rule dictionary was altered is invalidated and a new class loader is extended with the next request for the composite. The SOA instances not involved in updating the rule dictionary in SOA MDS regenerate the JAXB 2.0 classes for the composites that comprise a rule dictionary where the fact type model was altered. View the results in the audit trail. In the Recent Instances section of the Dashboard page, click the instance ID. In the Trace section of the Flow Trace page, click the UpdateSOAMDS BPEL service component. View the list of XSD schema files synchronized in SOA MDS in the audit trail, as shown in Figure 12-11. In previous releases, Oracle BPM Worklist included a feature known as flex fields. Starting with Release 11g R1 (11.1.1.4), flex fields are now known as mapped attributes. Do not confuse Oracle BPM Worklist flex fields with Oracle Fusion Applications flexfields; they are completely different features. After using a composite customized at runtime for a period of time, a new patch revision of the composite may become available. Repeating the process of customizing the new revision of the composite at runtime can be cumbersome and time-consuming. To avoid these challenges, use the OPatch tool. The OPatch tool is an Oracle-supplied, Java-based utility that enables you to merge customizations made during runtime in a previously deployed composite into a new patch revision of the composite. OPatch preserves your runtime customizations and prevents you from having to re-enter the customizations again for the next patch revision. OPatch merges a new patch revision into a composite that was previously customized during both design time in JDeveloper and runtime in Oracle SOA Composer, Oracle BPM Worklist, or Oracle Enterprise Manager Fusion Applications Control. For specific procedures on patching SOA composites with OPatch, see Oracle Fusion Applications Patching Guide. Before using the OPatch tool to merge runtime customizations from a previously deployed revision into a new revision, review the recommendations in Table 12-6 to ensure that you merge customizations successfully. Delete only components you added as part of the customization, and not components that are part of the base revision. This is because the deletion of base components does not survive the move to the new revision, but the deletion of the wiring does. If you delete an existing base component, it comes back again when you get the new revision, which still has the component. However, the wire deletion survives the upgrade because the composite.xml file is customizable. If business rules are customized at runtime, and those runtime customizations must be preserved in subsequent revisions of the base version of the composite, it is recommended that the rules dictionaries be split into two dictionaries and linked using the dictionary linking functionality. The base rule, linked dictionary contains the data model of the dictionary and the custom rules dictionary contains all the rules customized at runtime. The OPatch process preserves the customized dictionary when it merges the customized application with subsequent versions of the application. Business rules are used in different scenarios and the following information identifies how to handle each situation. -) Approval assignment and configuration rules to automatically be stored in a custom rules dictionary (Rule.rules). The custom rules dictionary is initially shipped with only sample, preseeded rules. The custom rules dictionary is separate from the base rule, linked dictionary (RuleBase.rules). The base rule, linked dictionary contains Oracle Fusion Applications fact definitions. Revision patches are applied to the base rule, linked dictionary. -) Changes in subsequent revision patches to be applied successfully to the base rule, linked dictionary. If you use Oracle SOA Composer to customize approval configuration and assignment rules during runtime, changes in subsequent revision patches are not applied successfully. You cannot customize existing rules that are part of the base version of the composite at design time in JDeveloper. However, you can extend new rules that you later customize. These rules are used directly in processes like BPEL and BPMN outside of the context of a human task. These dictionaries are not generated as linked dictionaries in JDeveloper and must be manually split as linked dictionaries. If the dictionaries are split as linked dictionaries, ensure that only the linked dictionaries are customized from Oracle SOA Composer. Identification of the base rule and linked rule dictionary is up to you to develop. Use default URLs for service binding components. If the revision is used in the URL for service binding components, when the SOA composite is patched using OPatch, the revision of the composite is customized. In this case, the reference to URLs for service binding components fails to work. In this scenario, you must manually update all the URL references for service binding components. If a base composite team removes the scope activity in the next revision of the composite, when a vertical composite team or customer runs the OPatch utility to apply the new revision of the composite to their customized version, all customizations they performed on that scope activity in the first revision are lost. When importing a SAR file for customization in JDeveloper, the composite must not be renamed. In addition, if you rename a composite, OPatch cannot detect runtime customizations made in Oracle SOA Composer, Oracle BPM Worklist, and Oracle Enterprise Manager Fusion Applications Control. You must manually re-apply those customizations. Assume you customize the base revision of a composite with the Customization Developer role in JDeveloper, and then deploy the composite. When the base revision is updated and a newer revision is made available, the customer uses OPatch to apply the patch revision. OPatch may then fail because there are JDeveloper customizations in the deployed composite. 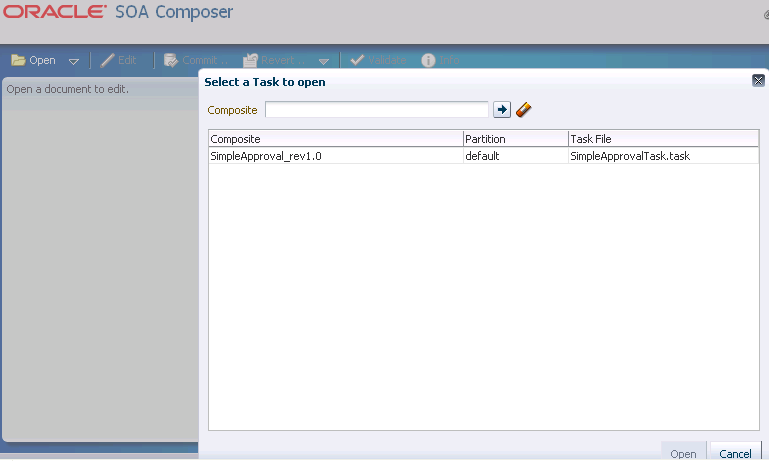 Open the customized composite with the Default Role in JDeveloper. Import the patched base version 2 SAR file into this composite project extended in Section 10.3, "Customizing SOA Composites with JDeveloper." Restart JDeveloper with the Customization Developer role. Open the above customized composite. Error messages are shown in case of conflicts. Resolve the conflicts in the composite. Deploy the composite to the SAR file. The new SAR file should be replaced by the patched base version 2 SAR file. Proceed with the OPatch process. Note: Ensure that the backup of the SAR files is taken properly. You can customize or extend some SOA components during design time in JDeveloper when logged in with the Customization Developer role. Components that are extended in JDeveloper can be further customized in JDeveloper when again logged in with the Customization Developer role. Customization changes are maintained in separate .xml files from the base component files. Note that you cannot make customizations in Source view in JDeveloper; only customizations made in Design view are supported. New artifacts extended in the composite survive patching. Ensure that you provide unique names for any new components and artifacts that you extend. For example, prefix each component and artifact name with a unique identifier. 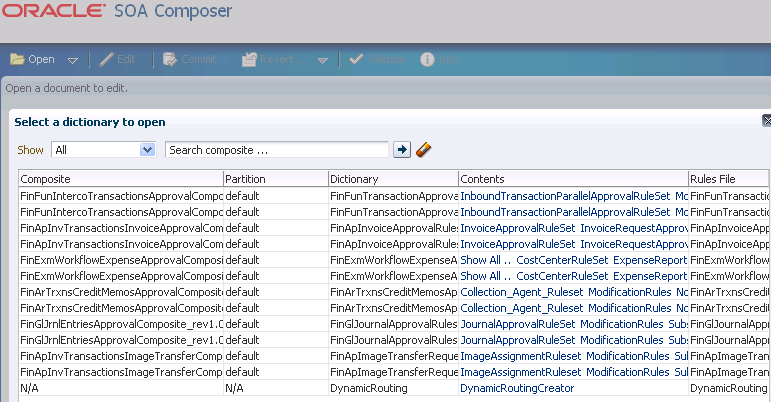 Table 12-7 describes which existing base composite artifacts in a composite can be customized and which new artifacts can be extended when logged in to JDeveloper with the Customization Developer role. Existing Artifact in Base Composite is Customizable with Customization Developer Role? Artifact is Extendable with Customization Developer Role? Table 12-8 provides more specific details about which artifacts can be extended when logged in to JDeveloper with the Customization Developer role. Only one composite per Oracle SOA Suite project is permitted. Can drag a BPEL process from the Component Palette into the SOA Composite Editor or Oracle BPEL Designer. Can drag an Oracle Mediator from the Component Palette into the SOA Composite Editor or Oracle BPEL Designer. Can drag a human task from the Component Palette into the SOA Composite Editor or Oracle BPEL Designer. Can drag a business rule from the Component Palette into the SOA Composite Editor or Oracle BPEL Designer. Can extend a transformation in a transform activity in Oracle BPEL Designer or the Mediator Editor. The New Gallery dialog is disabled with the Customization Developer role. Right-click an Oracle SOA Suite project and select SOA, or as the result of extending other SOA artifacts. Subscribe to or publish events for a BPEL process or Oracle Mediator component in the SOA Composite Editor, Oracle BPEL Designer, or Mediator Editor. Drag adapters from the Component Palette into the SOA Composite Editor or Oracle BPEL Designer. This section provides an overview of the steps for customizing a base composite of Oracle Fusion Applications in JDeveloper. These steps assume you know how to set up the customization layer through the adf-config.xml editor and know the customization classes defined by Oracle Fusion Applications. For more information, see Chapter "Customizing SOA Composite Applications" of the Oracle Fusion Middleware Developer's Guide for Oracle SOA Suite. See Section 10.3.2, "Setting Up the JDeveloper Workspace and Composite Project for MDS Customization" for instructions on setting up the JWS workspace and composite project when customizing Oracle Fusion Applications composites. Install Oracle Fusion Applications with a SOA composite that you want to customize in JDeveloper. In Oracle Enterprise Manager Fusion Applications Control, go to the home page of the SOA composite to export. From the SOA Composite menu at the top of the page, select Export. Checking out the base composite project from the source control system where the base composite project was checked in by the base development team. This way, no SAR file deployment, export command, or import command is involved. Importing the base composite SAR file that was deployed from the base composite project. Importing the base composite SAR file that was exported (without runtime changes) from the Export Composite page of the Oracle Enterprise Manager Fusion Applications Control installation from which the SOA server is managed. Extend layer values for customization to the CustomizationLayerValues.xml file (can perform this task in JDeveloper or from the directory structure). Start JDeveloper in the Default Role. Extend a new composite application. From the File main menu, select Import > SOA Archive Into SOA Project to import the exported SAR into the new composite in JDeveloper. In the Import Composite Archive wizard, select the Import For Customization checkbox. From the Tools main menu, select Preferences > Roles > Customization Developer. Restart JDeveloper, and customize the layers of the composite. Right-click the project and select Deploy to extend a customized SAR of the SOA composite in Oracle Fusion Applications. After performing the initial customizations described in these procedures, you can no longer export the composite from the runtime. This is because the composite is a merged composite, and no longer the original base composite. For more information on exporting SAR files, see Section "Exporting a Running SOA Composite Application" of Oracle Fusion Middleware Administrator's Guide for Oracle SOA Suite and Oracle Business Process Management Suite. You can extend business rules in a composite during design time in JDeveloper when logged in with the Customization Developer role. After extending these business rules, you can further customize them in JDeveloper when again logged in with the Customization Developer role. You cannot customize existing business rules that are part of the base version of the composite. For information on customizing business rules during runtime, see Section 12.2, "Customizing SOA Composites." For more information about extending or customizing BPEL processes, see Part "Using the BPEL Process Service Component" of Oracle Fusion Middleware Developer's Guide for Oracle SOA Suite. You can extend human tasks in a composite during design time in JDeveloper when logged in with the Customization Developer role. After extending these human tasks, you can further customize them in JDeveloper when again logged in with the Customization Developer role. You cannot customize existing human tasks that are part of the base version of the composite. For more information on extending human tasks, see Part "Using the Human Workflow Service Component" of Oracle Fusion Middleware Developer's Guide for Oracle SOA Suite. Make any other changes, except those that impact files such as XSLs (for transformations), WSDLs, EDLs (for business events), or XSDs. Note that new artifacts can be extended or customized. For more information, see Part "Using the Oracle Mediator Service Component" of Oracle Fusion Middleware Developer's Guide for Oracle SOA Suite. For more information, see Chapter "Developing SOA Composite Applications with Oracle SOA Suite" of Oracle Fusion Middleware Developer's Guide for Oracle SOA Suite. Specify the mapper file (.xsl) to which the transform activity points from the Mapper File field of a transform activity in a BPEL process or the Transformation Map dialog of an Oracle Mediator. However, you cannot extend or customize mappings. The mappings are defined in the XSL file (not in the transform activity), which is not customizable. Copy an out-of-the-box XSL file into a custom XSL artifact, add the custom logic to the custom XSL, and customize the transform activity to reference the custom XSL. Additionally, you must copy the contents of the XSL file in the base composite into the custom XSL file. You can extend an XSD schema or WSDL document in JDeveloper when logged in with the Customization Developer role. Right-click the Oracle SOA Suite project in the Application Navigator. Invokes the Create XML Schema dialog for extending a new XML schema file in the project. When complete, the new schema file automatically opens. Invokes the Create WSDL dialog to extend a new WSDL file in the project. You can extend business events in JDeveloper when logged in with the Customization Developer role. For more information, see Chapter "Using Business Events and the Event Delivery Network" of Oracle Fusion Middleware Developer's Guide for Oracle SOA Suite. You can extend JCA adapters in JDeveloper when logged in with the Customization Developer role. For more information, see Oracle Fusion Middleware User's Guide for Technology Adapters. During base composite development, you create a customizable SOA project from the Default role in JDeveloper, set up customization layers, and deploy the composite to a base SAR file. During customization, you import (for customization) the base composite SAR file to extend a new SOA project, change from the Default role to the Customization Developer role, perform customizations, and deploy the composite to create a customized SAR file. For more information, see Chapter "Customizing SOA Composite Applications" of the Oracle Fusion Middleware Developer's Guide for Oracle SOA Suite. 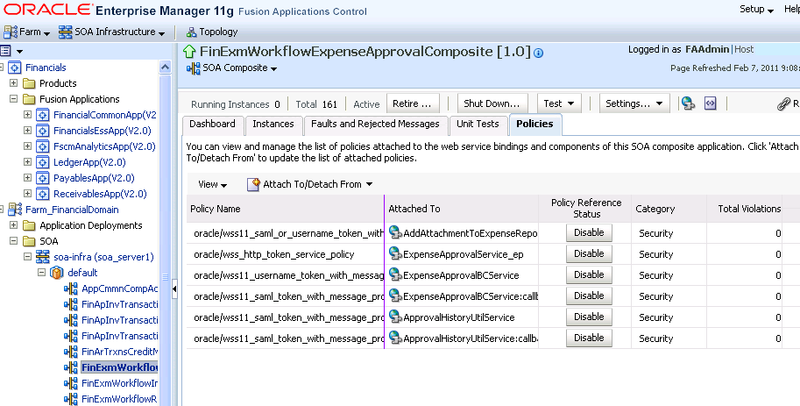 You can extend new SOA composite services to integrate with Oracle Fusion Applications. This section provides an overview of tasks for extending and consuming new services and provides references to documentation that more specifically describes these tasks. You must set up and configure a development environment in JDeveloper to create new Oracle SOA Suite services. For more information, see Part "Getting Started Building Your Oracle Fusion Applications" of Oracle Fusion Applications Developer's Guide. Whenever you create new projects, you must first create an application using templates provided by JDeveloper. For more information, see Chapter "Setting Up Your JDeveloper Workspace and Projects" of Oracle Fusion Applications Developer's Guide. You can select an Oracle SOA Suite project template when creating a JDeveloper application. For more information about creating Oracle SOA Suite projects, see Chapter "Developing SOA Composite Applications with Oracle SOA Suite" of Oracle Fusion Middleware Developer's Guide for Oracle SOA Suite. You can extend an Oracle Application Development Framework (ADF) Business Component service to be consumed by the SOA composite. The Oracle ADF Business Component service is used for connecting Oracle ADF applications using service data object (SDO) data formats with the SOA composite. For more information, see Chapter "Getting Started with Binding Components" of Oracle Fusion Middleware Developer's Guide for Oracle SOA Suite. For more information about these and other design categories, see Part "Common Service Use Cases and Design Patterns" of Oracle Fusion Applications Developer's Guide. The Oracle Metadata Services (MDS) Repository contains metadata for certain types of deployed applications, such as SOA composites. You can store Oracle Fusion Applications artifacts and custom artifacts in the MDS repository. You connect to the repository to consume these artifacts. For more information about MDS, see Chapter "Managing the Metadata Repository" of Oracle Fusion Middleware Administrator's Guide. For more information about creating a connection from Oracle SOA Suite to MDS, using the Oracle SOA Suite MDS repository to store custom artifacts, and connecting to and consuming artifacts from the Oracle SOA Suite MDS repository, see Section "Creating a SOA-MDS Connection" of Oracle Fusion Middleware Developer's Guide for Oracle SOA Suite. Use Oracle Enterprise Repository to discover the service. Follow the link provided by Oracle Enterprise Repository to access the WSDL file. When building the client, have JDeveloper download the WSDL file locally so that the client is not accessing the runtime WSDL file. For more information about Oracle Enterprise Repository, see Oracle Fusion Middleware User Guide for Oracle Enterprise Repository. You must secure Oracle Fusion Applications and services to be consumed by SOA composites. For more information about Oracle Fusion Applications security, see Oracle Fusion Applications Security Guide. For more information about ADF Application Artifacts security, see Chapter 15, "Customizing Security for ADF Application Artifacts." For more information about web services security, see Chapter "Securing Web Services Use Cases" of Oracle Fusion Applications Developer's Guide. You must deploy SOA composites and the services to be consumed. For more information about deploying SOA composites, see Chapter "Deploying SOA Composite Applications" of Oracle Fusion Middleware Developer's Guide for Oracle SOA Suite. For more information about deploying external references such as web services, see Chapter "Deploying Web Services Applications" of Oracle Fusion Middleware Security and Administrator's Guide for Web Services. An enterprise deployment is an Oracle guidelines blueprint based on proven Oracle high-availability and security technologies and recommendations for Oracle Fusion Applications. For more information about deployment in an enterprise environment, see Oracle Fusion Applications Enterprise Deployment Guide.